1. Why does CaF2 have a higher melting point than NH3? (A) CaF2 is more massive and thus has stronger London disperson forces. (B) CaF2 exhibits network covalent bonding, which is the strongest type of bonding. (C) CaF2 is smaller and exhibits greater Coulombic attractive forces. (D) CaF2 is an ionic substance and it requires a lot of energy to break up an ionic lattice. 2. Which of the following pairs of elements is most likely to create an interstitial alloy? 3. Which of the following molecules would exhibit the strongest dipole moment? 4. Why can a molecule with the structure of NBr5 not exist? (A) Nitrogen only has two energy levels and is thus unable to expand its octet. (B) Bromine is much larger than nitrogen and cannot be a terminal atom in this molecule. (C) It is impossible to complete the octets for all six atoms using only valence electrons. (D) Nitrogen does not have a low enough electronegativity to be the central atom of this molecule. Use the following information to answer questions 5-8. An evacuated rigid container is filled with exactly 2.00 g of hydrogen and 10.00 g of neon. The temperature of the gases is held at 0°C and the pressure inside the container is a constant 1.0 atm. 5. What is the mole fraction of neon in the container? 6. What is the volume of the container? 7. Which gas has the higher boiling point and why? 8. Which gas particles have a higher RMS velocity and why? 9. 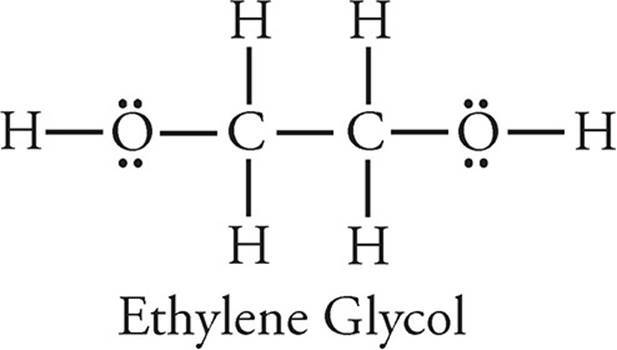 Which of the following compounds would have the highest lattice energy? 10. What is the bond order for the O-O bond in ozone, O3? 11. A liquid whose molecules are held together by only which of the following forces would be expected to have the lowest boiling point? 12. Which of the following species does NOT have a tetrahedral structure? 13. The six carbon atoms in a benzene molecule are shown in different resonance forms as three single bonds and three double bonds. If the length of a single carbon–carbon bond is 154 pm and the length of a double carbon–carbon bond is 133 pm, what length would be expected for the carbon–carbon bonds in benzene? 14. Which of the following molecules will have a Lewis dot structure with exactly one unshared electron pair on the central atom? 15. Which of the following lists of species is in order of increasing boiling points? 16. Which of the molecules listed below has the largest dipole moment? 17. A mixture of gases contains 1.5 moles of oxygen, 3.0 moles of nitrogen, and 0.5 moles of water vapor. If the total pressure is 700 mmHg, what is the partial pressure of the nitrogen gas? 18. A mixture of helium and neon gases has a total pressure of 1.2 atm. If the mixture contains twice as many moles of helium as neon, what is the partial pressure due to neon? 19. Nitrogen gas was collected over water at 25°C. If the vapor pressure of water at 25°C is 23 mmHg, and the total pressure in the container is measured at 781 mmHg, what is the partial pressure of the nitrogen gas? 20. A 22.0 gram sample of an unknown gas occupies 11.2 liters at standard temperature and pressure. Which of the following could be the identity of the gas? 21. Which of the following expressions is equal to the density of helium gas at standard temperature and pressure? If the initial pressure in the container before the reaction is denoted as Pi, which of the following expressions gives the final pressure, assuming ideal gas behavior? 23. An ideal gas fills a balloon at a temperature of 27°C and 1 atm pressure. By what factor will the volume of the balloon change if the gas in the balloon is heated to 127°C at constant pressure? 24. A gas sample with a mass of 10 grams occupies 6.0 liters and exerts a pressure of 2.0 atm at a temperature of 26°C. Which of the following expressions is equal to the molecular mass of the gas? The gas constant, R, is 0.08 (L·atm)/(mol·K). 25. A substance is dissolved in water, forming a 0.50-molar solution. If 4.0 liters of solution contains 240 grams of the substance, what is the molecular mass of the substance? 26. How many moles of Na2SO4 must be added to 500 milliliters of water to create a solution that has a 2-molar concentration of the Na+ ion? (Assume the volume of the solution does not change). Use the following Lewis diagrams to answer questions 27−29. 27. Which substance would have the highest boiling point? (D) All three substances would have very similar boiling points because their molar masses are similar. 28. Which substance would have the highest vapor pressure? (D) All three substances would have similar vapor pressure because they have a similar number of electrons. 29. Which of the substances would be soluble in water? (D) All three substances would be soluble in water due to their permanent dipoles. 1. Use the principles of bonding and molecular structure to explain the following statements. (a) The boiling point of argon is −186°C, whereas the boiling point of neon is −246°C. (b) Solid sodium melts at 98°C, but solid potassium melts at 64°C. (c) More energy is required to break up a CaO(s) crystal into ions than to break up a KF(s) crystal into ions. (d) Molten KF conducts electricity, but solid KF does not. 2. The carbonate ion is formed when carbon dioxide, CO2, reacts with slightly basic cold water. (a) (i) Draw the Lewis electron dot structure for the carbonate ion. Include resonance forms if they apply. (ii) Draw the Lewis electron dot structure for carbon dioxide. (b) Describe the hybridization of carbon in the carbonate ion. (c) (i) Describe the relative lengths of the three C–O bonds in the carbonate ion. (ii) Compare the average length of the C–O bonds in the carbonate ion to the average length of the C–O bonds in carbon dioxide. (a) Explain the differences in the properties given in the table above for each of the following pairs. (b) Use the principles of molecular bonding to explain why H2 and O2 are gases at room temperature, while H2O is a liquid at room temperature. (a) Draw a Lewis electron dot diagram for each of the molecules listed above. (b) Use the valence shell electron-pair repulsion (VSEPR) model to predict the geometry of each of the molecules. 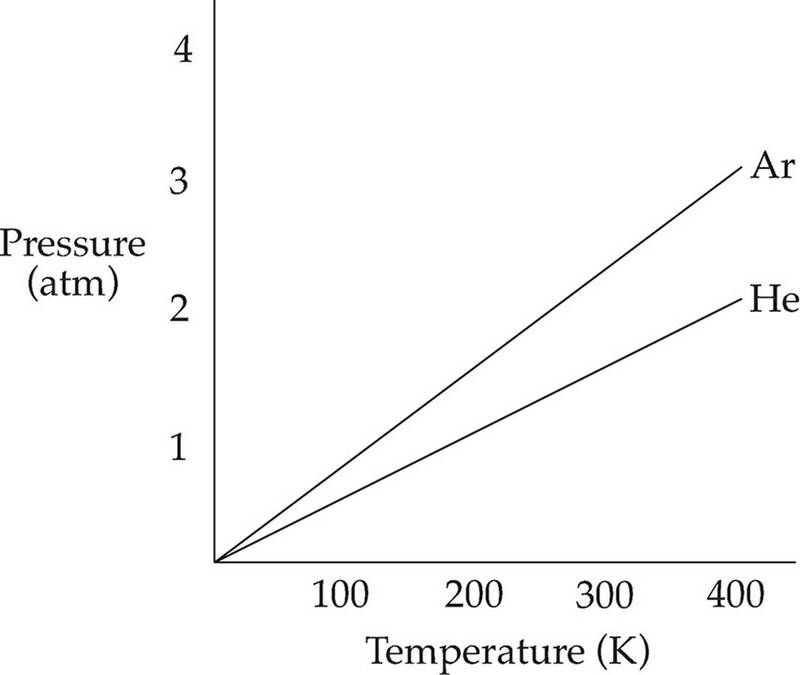 The graph above shows the changes in pressure with changing temperature of gas samples of helium and argon confined in a closed 2-liter vessel. (a) What is the total pressure of the two gases in the container at a temperature of 200 K? (b) How many moles of helium are contained in the vessel? (c) How many molecules of helium are contained in the vessel? (d) Molecules of which gas will have a greater distribution of velocities at 200 K? Justify your answer. (e) If the volume of the container were reduced to 1 liter at a constant temperature of 300 K, what would be the new pressure of the helium gas? The reaction above took place, and 1.45 liters of oxygen gas were collected over water at a temperature of 29°C and a pressure of 755 millimeters of mercury. The vapor pressure of water at 29°C is 30.0 millimeters of mercury. (a) What is the partial pressure of the oxygen gas collected? (b) How many moles of oxygen gas were collected? (c) What would be the dry volume of the oxygen gas at a pressure of 760 millimeters of mercury and a temperature of 273 K? (d) What was the mass of the KClO3 consumed in the reaction? 7. Equal molar quantities of two gases, O2 and H2O, are confined in a closed vessel at constant temperature. (a) Which gas, if either, has the greater partial pressure? (b) Which gas, if either, has the greater density? (c) Which gas, if either, has the greater concentration? (d) Which gas, if either, has the greater average kinetic energy? (e) Which gas, if either, will show the greater deviation from ideal behavior? 8. 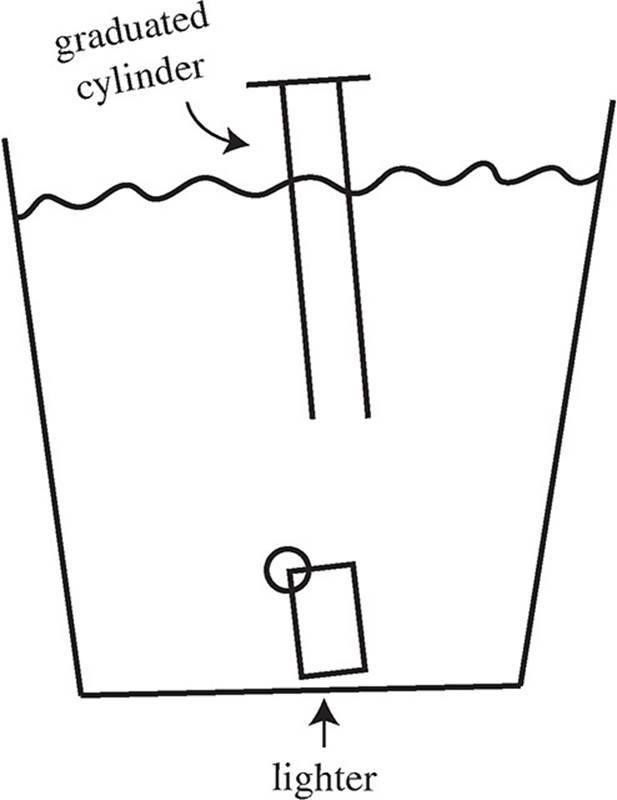 A student performs an experiment in which a butane lighter is held underwater directly beneath a 100-mL graduated cylinder which has been filled with water as shown in the following diagram. (a) Given that the vapor pressure of water at 19.0°C is 16.5 mmHg, determine the partial pressure of the butane gas collected in atmospheres. (b) Calculate the molar mass of butane gas from the experimental data given. (c) If the formula of butane is C4H10, determine the percent error for the student’s results. (d) The following are common potential error sources that occur during this lab. Explain whether or not each error could have been responsible for the error in the student’s results. (i) The lighter was not sufficiently dried before massing it after the gas was released. (ii) The gas in the lighter was not held underwater long enough to sufficiently cool it to the same temperature of the water and was actually at a higher temperature than the water. (iii) Not all of the butane gas released was collected in the graduated cylinder.